November 21, 2018 at 3:23p.m. Photo by David Dermer | Youngstown will be turning to a backup plan after the Christmas tree it planned to place on Central Square broke apart Wednesday. The tree, which was at a Fifth Street home in Struthers, snapped at the top as crews tried to remove it and put it on a truck. Jason Mauldin uses a chainsaw to cut up a section. Normally, backup plans are developed and are never needed. Youngstown, however, will be turning to a backup plan after the Christmas tree it planned to place on Central Square broke apart Wednesday. 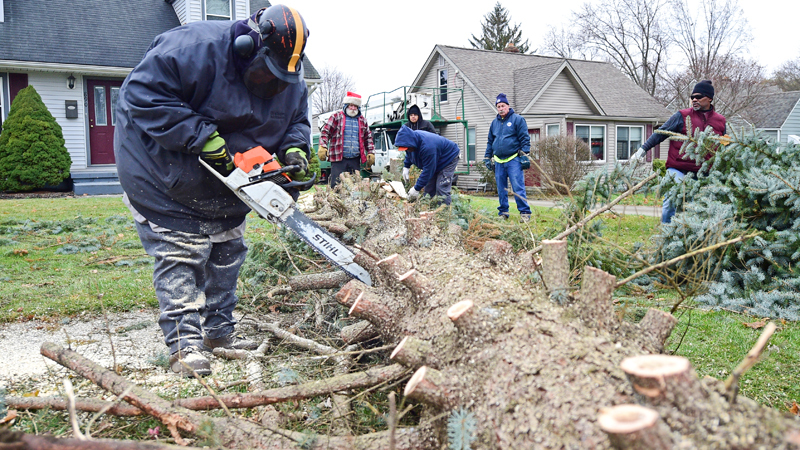 Dawn Turnage, Parks and Recreation commissioner, said the tree, which was at a Fifth Street home in Struthers, snapped at the top as crews tried to remove it and put it on a truck. The tree was 55 feet tall, 32 feet across and weighed more than 10,000 pounds. Marty Martin, who works for Diamond Steel Construction, counted the tree’s rings and said it was about 34 years old. Turnage said the piece that snapped weighs about 300 pounds. No one was injured. “It’s like hitting a foul ball,” city employee Tom Sakmar said. Bob Testor, who donated the tree, was disappointed that the tree will not be displayed. “I wanted to see it all lit up. That would have been great. Now [the tree lighting is] going to be delayed again,” Testor said. Because of the mishap, the city will now turn to its backup plan to find another tree, Turnage said. She said she hopes a new tree can be delivered to the city by the end of next week. She said this is the first time the city has ever had to use its backup plan when acquiring a tree. Turnage said she did not want to comment yet on where the new tree will come from until the arrangements are finalized. Turnage said the city first began its tree selection process in August, and the tree that was selected had been assessed several times, including recently, before it broke apart. Turnage said she wanted to thank Diamond Steel, Ohio Edison, and city workers from several departments for their work Wednesday. November 21, 2018 1:11 p.m.
November 18, 2014 10:46 a.m.
November 27, 2013 12:03 a.m.
November 21, 2014 12:01 a.m.
November 15, 2017 12:48 p.m.